Venue: Westcott Park Community Centre & Garden, 13 Ferguson Drive, Acton, London. W3 6YP. Advance Booking ONLY; See below. Day 1: Introduction to permaculture; Visit to the community garden. Day 2: Permaculture applied-design: A volunteers plan; Practical gardening. £60 if you live outside a one mile radius of the garden. This course is partially funded by Catalyst Gateway and supported by Routes of Wholeness. 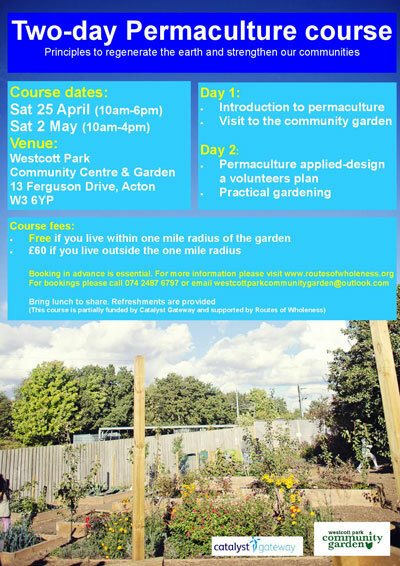 Note: Bookings for this course are being taken by Westcott Park Community Garden, not by Routes of Wholeness. Posted on March 31, 2015, in Courses, events, food growing, permaculture and tagged courses, events, food, London, nature, permaculture. Bookmark the permalink. Leave a comment.